Mark Roberts was born in central Illinois and raised here. He is also a renowned playwright, comic and television scribe. 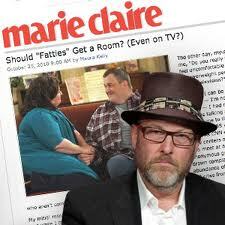 He is the creator and executive producer of the CBS series Mike & Molly and the author of several hit plays. Roberts’ comedy career began at an early age when he worked as a stand-up comedian in Chicago while pursuing a career in acting and writing. After re-locating to Los Angeles, Roberts became a regular comedian on The Tonight Show and was a series regular on The Naked Truth with Tea Leoni. He was also a guest star on television series such as Seinfeld, Friends, The Practice, The Larry Sanders Show and The Fresh Prince of Bel-Air and starred in feature films Next of Kin and Bulletproof. In theater, Roberts has written and produced several hit plays all of which are marked by his quick wit and comic sensibilities. Such productions include Welcome to Tolono, Whitey, Where the Great Ones Run, Parasite Drag, and Rantoul and Die. Several of his works have been picked up by the Dramatists Play Service, Inc. and published into acting editions. After writing and starring in the one-act comedy, Couples Counseling Killed Katie, Robert’s comic spin on eight couples going through therapy turned the production into a sold out, cult phenomenon and showcased his talents to television executive Chuck Lorre who hired Roberts as a writer on Two and a Half Men. The show quickly became a ratings success and Roberts rose through the ranks to executive producer and head writer, most recently departing to create his own series, Mike & Molly. Mike & Molly, which stars Melissa McCarthy and stand-up comedian Billy Gardell, focuses on the blossoming relationship between two people who meet at Overeaters Anonymous. Roberts’ comic-sensibilities made the series the most watched new comedy of Fall 2010 and earned McCarthy an Emmy Award for Outstanding Lead Actress.